San Diego Regional EDC’s Annual Dinner will be held on June 4, 2015 at Sea World San Diego. Point Loma Nazarene University (PLNU) is once again serving as the underwriter for this year’s 50th Anniversary celebration. 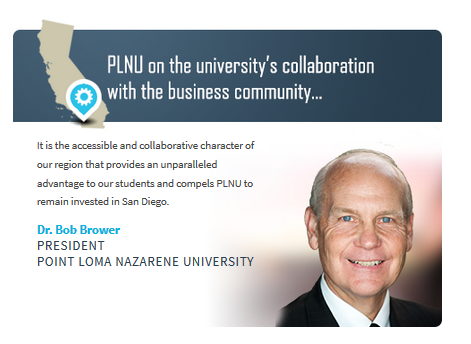 We sat down with PLNU president, and EDC board member, Dr. Bob Brower to learn more about PLNU and what’s in store for the future - as they work together with the region’s other universities, to help develop San Diego’s next generation of leaders. 1) Tell us about PLNU. Founded in Pasadena, California in 1902, PLNU moved to Point Loma in 1973 with 1,000 students. Since coming to San Diego, PLNU has experienced unprecedented institutional growth and development alongside the rapidly growing San Diego region. Today we serve over 3,600 students at our residential campus in Point Loma, in regional centers across Southern California and online. As a liberal arts institution, PLNU is known for being forward-thinking. At PLNU, academics, faith, and community are all vital. Students benefit from this balanced approach to education and leave PLNU prepared to think, act, and contribute to San Diego and the world. During our four decades in San Diego we have become an institution known for excellence in academic preparation, wholeness in personal development, and faithfulness to mission. It is the accessible and collaborative character of our region that provides an unparalleled advantage to our students and compels PLNU to remain invested in San Diego. Our students benefit from a region that is invested in developing talent to compete on the world stage - while maintaining a distinctly regional focus. Furthermore, the collaborative relationships that exist among San Diego’s robust and diverse higher education and business communities further affirms our respective institutions’ commitment to educational quality for the benefit of our students and the future of San Diego. Through faculty leadership and community support, our students and alumni actively contribute to regional dialogue and potential solutions on a variety of issues. PLNU’s Fermanian Business and Economic Institute is actively informing local economic policy in the areas of housing affordability, military economic impact and homelessness. The Center for Justice and Reconciliation at PLNU serves as a regional convener of local law enforcement, nonprofit agencies and policy makers in the continued campaign against human trafficking in San Diego. Our Institute for Politics and Public Service, through the Malin Burnham Center for Civic Engagement, is engaged in the study and practice of civil discourse together with the promotion of the quality of life in a community, through both political and non-political processes. School of Nursing faculty and students are invested in the community of City Heights through PLNU’s Health Promotion Center, providing health education, screening and access to care. 3) What do you anticipate for PLNU in the next 5 years? Steven Mintz, writing in The Chronicle of Higher Education, explained more than two years ago that “higher education is now in a revolution of change.” American colleges and universities are experiencing the most rapid and dramatic changes in history – PLNU is no exception. Preparing students as effective leaders in a rapidly changing world is not a new calling for PLNU; it is the foundation of our history and work. For generations, PLNU has developed students deep in conviction and life skills who were academically well prepared to meet the challenges and opportunities of their day. In effort to support this development, PLNU will celebrate the completion of our new science complex this summer. With nearly 40 percent of PLNU’s undergraduate students majoring in one of the STEM-related disciplines, this much-needed facility reflects the quality of our faculty and students, further strengthening the undergraduate research programs which offer students the ability to conduct faculty mentored research. This hallmark of the undergraduate science experience at PLNU produces graduates ready for future doctoral research and equipped to serve in San Diego’s life science and high tech clusters – but it is not unique to the STEM disciplines. As in the past, we will continue to develop critical and ethical thinkers equipped to meet San Diego’s workforce needs in the STEM, humanities and business fields. PLNU remains focused on strengthening and expanding our distinctive learning community and enhancing our ability to respond proactively to the dynamic environment of higher education and the San Diego region. We continue to develop strategies and programs for degree access beyond the traditional, residential campus. Whether through new hybrid and online programs in advanced studies or adult degree completion, or baccalaureate partnerships with the region’s community colleges, we strive to serve new populations of students, thus allowing PLNU to further meet the workforce development needs in our region and prepare effective leaders who impact San Diego and the world. 4) What do you anticipate for the San Diego region? As a region, San Diego is not immune to change. Building upon a unique culture of creativity and collaboration, San Diego has - and will continue to - distinguish itself as a leader in innovation, defense, healthcare, and tourism sectors. This necessitates the training and development of human capital in a variety of ways to better meet San Diego’s current and future workforce needs.